LivingDNA is a company founded in part to help the world with genetic testing. Founded in the UK, the company has established initiatives to educate students on genetic ancestry and create a worldwide family tree. The company’s DNA test kit claims to be one of the most specific in the game. Unlike many other companies, LivingDNA has a strong privacy guarantee and will only use your data in research, and only with your consent. Founded in 2002, the company is growing into a major competitor in the ancestry testing market. Check out this executive summary of this LivingDNA review, and see the whole thing below! Conclusion: LivingDNA is a great choice for users who have a family tree started, and want some historical and genealogical context. They offer a suite of tools for analyzing your ancestry, including potential migrations your family went and ethnicity estimation. However, the platform lacks an ability to contact genetic matches and does not test for any health or medically relevant information. Special Features Allows users to analyze their data on a platform which also gives detailed history on the events of the time. The company also produces an individualized coffee-table book for users, which explains the reports and scientific content. LivingDNA is the brainchild of David Nicholson and Hannah Morden, who lead DNA Worldwide Group. Set up in 2002, the company is based out of Frome, England. Though the company started small and mostly served customers from the United Kingdom, their business grew rapidly. The company has a mission to “dissolve the concept of race” through an understanding of human ancestry. Currently growing at oven 40% a year, the company is bringing in millions of dollars. The company now employs over 35 people, along with a hundred international contributors. These are typically scientists which help research and grow the platform. In 2017, the company started to realize its mission of eliminating racism, by starting the One Family World Project. The project aims to create a single, worldwide family tree based on their user’s DNA. Eventually, the company claims that users will be able to accurately pinpoint their family history to specific geographic locations. Another recent project included teaching school children about human genetics and ancestry. The company prides themselves on not selling aggregate genetic information, and only uses it for research projects like the one above. Users must first consent to be a part of these studies before their data is incorporated. LivingDNA offers one main service, their 3-1 Ancestry Test. This service includes a DNA test kit and lifetime access to their platform. On their platform, users can explore their genetic ancestry. The results included are based on autosomal, Y-DNA, and mtDNA. This means that LivingDNA can track both where your individual genes came from, and which maternal and paternal haplotypes you belong to. The test is called the 3-1 because they claim it offers 3 solutions in one test. They claim it can tell you where your family is from, allow you to know more about yourself, and discover more details about your ancestry. These claims do see to be very similar, but their platform does offer some interesting features. For instance, the platform will analyze your autosomal DNA for matches to various ethnic groups. The company has a large majority of UK customers, and as such their specificity for this region is very high. The company currently offers matching to about 80 world regions, and their accuracy is increasing as they research more genetic data. The maternal and paternal haplotypes are analyzed, and you can find reports detailing these groups and their possible origins. LivingDNA offers a unique feature in that it can provide a historical context for the time-period and place that your ancestors lived. For many users, this is a fun and informative tool. The 3-1 Ancestry Test is $99, currently being offered on sale for $79. For this price you get your genes analyzed, and get lifetime access to the platform, your results, and any upgrades. This is a significant value, considering that LivingDNA is constantly researching relatedness. For an additional $69, users can receive a personalized book which walks them through their genetic testing results. The book details many of the same aspects as the platform, showing what percentage of various ethnicities contributed to your DNA, and where those groups originated from. The book also details you haplotypes, and any migrations your ancestors have been on. In addition, the book discusses the science behind ancestry testing and what the results can tell you. It is bound in a hardcover and can be kept personally or shared with friends and family. The book can be selected as an additional option when purchasing a kit on the company’s website. What separates LivingDNA from other companies in that regard? LivingDNA was founded in the UK, and has its largest base of customers there. Though this will change over time, it is likely the most specific test for ancestors coming from the British Isles. While some reviews have slanted the company for over or underestimating their results, these will change over time as more users are added to the database. The company’s haplotype testing contains a high number of sites, which means that as their database grows, their results are likely to be the most accurate. The company’s platform offers an interactive and unique way to look at these results, including in pedigree or geographic form. The Ancestry Book is certainly a unique offering, and no other companies seem to offer any commemorative materials with their DNA tests. Though several companies offer a family tree service, LivingDNA does not. Instead, they offer a variety of resources and historical context to help you find evidence to complete a family tree. How it works, what will your kit include? The test kit you receive in the mail will have a small cheek swab. Wipe the swab along the inside of your cheek, and store it in the provided container. Put it in the pre-paid envelope, and ship it off to the laboratory. This company takes around 10-12 weeks to process the sample, slightly longer than others. At that time, you will be able to login to your account and review your results. On the LivingDNA platform, you will be able to review a number of aspects of your ancestry. The company provides ethnicity matching, as well as haplotype information. These different results can tell you a number of things. When they analyze your autosomal DNA, they are looking for where those genes come from. By comparing the sequences in your DNA to families who have lived in the same area for generations, the company can tell where your genes originated. This report will show the amount of each ethnicity which contributed to your genetics. The company monitors over 80 regions, but some are more specific than others. In analyzing your Y-DNA and mtDNA, the company can determine your maternal and paternal haplotypes. Y-DNA is passed only through the male line of your family, and is thus likely not assessed for females. The mtDNA is found in mitochondria and is passed down from your mother. By analyzing matches in these segments of DNA, a fairly accurate estimate can be created of your deep ancestry. These reports can detail which groups you are related to, and how they traveled around the globe over time. The Ancestry Book contains all of these results, and scientific explanations of how the process works. Unlike many companies, LivingDNA will not share your data with for-profit companies. Many companies protect your personal information, but sell genetic data in aggregate. LivingDNA makes a point of not adhering to this practice. In fact, one of the main things found in researching LivingDNA is their commitment to keeping data private. In fact, LivingDNA only works with academic institutions when researching your DNA. Further, you must opt-in to the research studies. This information can be found in their Privacy Centre. Like other companies, they allow you to reserve the right to withdraw your consent at any time. The company will destroy your sample, and your information will be erased. Like other DNA testing companies, there are a number of editorial reviews online about LivingDNA, as well as a wide variety of media coverage. Notable for this company is their take on data privacy. Where other companies shy from the privacy issue, multiple publications have published LivingDNA’s commitment to privacy concerns, and their unwillingness to work with pharmaceutical companies. Many articles also note that while LivingDNA may be one of the smaller genetic testing companies, they claim to offer the highest detail ancestry service available. A search for reviews of LivingDNA on Google offers mixed results. On Amazon, the company has only 9 reviews (as of this writing), and they either love it or hate it. On Trustpilot, there are only 8 reviews and they lean against the service. However, a number of bloggers have tested the product and most found it informative. In general, users seem to be impressed with the detail and historical information LivingDNA can give them. Others are disappointed in the results, noting that the company’s database largely favors customers from the United Kingdom. LivingDNA offers one of the most accurate and thorough ancestry DNA tests. Though the company does not include any health or medical tests, this could change in the future. This company has a worthy mission, and also helps educate students on the relatedness of all people to combat race disparities. 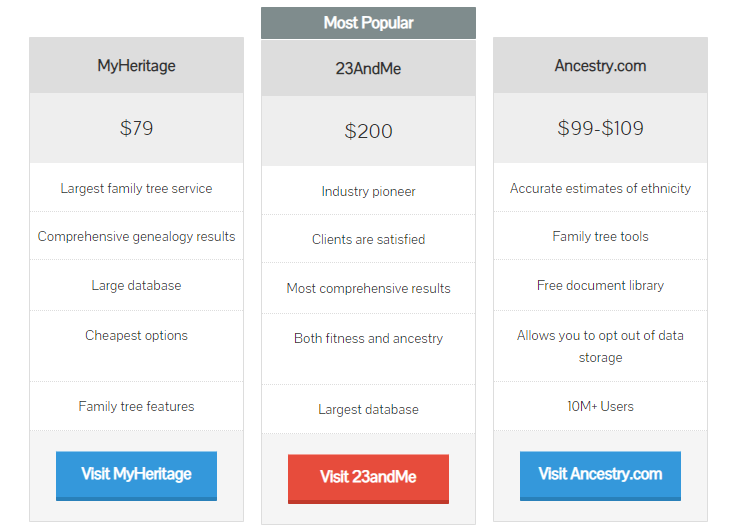 Compared to other ancestry companies, LivingDNA has a leg up in terms of price, as the one-time payment includes lifetime access. Other companies may charge a subscription for updates like this. Over time, their tests will get more accurate and they will likely be a leading provider of DNA tests.